Princeville. East Peoria. Springfield. These are the cities where you can find central Illinois's leader in new and used lawn mowers as well as landscaping, agriculture, and construction equipment. That company is German Bliss. And at most of these locations, customers can use repair service on an array of make and model mowers, including zero turn mowers. German Bliss has been the place to go for lawn mower repair services and new and used product sales for 75 years. 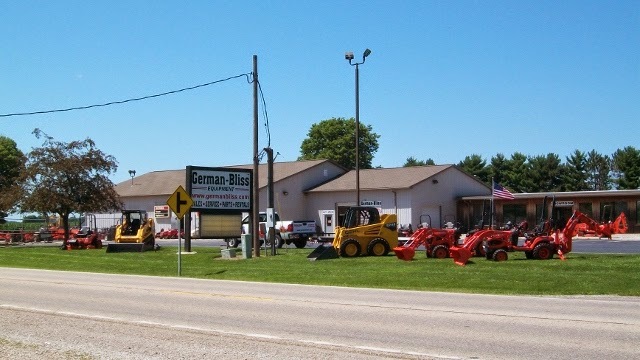 The three locations – Princeville, East Peoria, and Springfield – make German Bliss the accessible leader for new and used lawn mower sales and service. In need of landscaping equipment? German Bliss has a wide selection of the top-line Kubota compact tractors and mini-excavators that are the choice of landscapers and estate owners. From utility vehicles to zero turn mowers, German Bliss can supply the equipment needs for any landscaping project planned or underway. Large capacity mowing equipment is not the sum of gear offered to tackle any landscaping needs. German Bliss has Stihl chainsaws and Kinze planters, as well as trimmers and blowers. They offer a wide array of equipment, from auger wagons to Bush hog mowers and Landpride mowers. Gem Electric vehicles and more can all be found at the Princeville location. Whether looking for a new lawn mower or a high-quality used machine, German Bliss has a large line up of mowers from which to choose just the right piece of equipment to fit the needs of any project. German Bliss keeps a huge stock on hand, so if it's Stihl hand-held power equipment or the lawn mower simply needs a few new parts, there is online purchasing offered for customer convenience. German Bliss can ship parts straight to any home or business. Customers can browse through the inventory of new and pre-owned items online. The user friendly website lets customers search for just the right part, place an order, and it will be shipped right away. To maintain the investment made in lawn equipment, look for seasonal repair special promotions for the required seasonal check-up on all equipment. German Bliss has a fully stocked parts department that can turn work around fast, so there's little waiting time on equipment repairs. From Land Pride zero-turns to Bush Hog mower parts, and from hand-held Stihl power equipment to skid steer loaders and track loaders, German Bliss has it all. Check out the large inventory of new equipment and pre-owned inventory. German Bliss is the regional headquarters for SnowEx Spreaders, whether for commercial or home use. There is also an industry exclusive 5-year extended warranty program through FAIL-SAFE available. German Bliss in Princeville, East Peoria, and Springfield. The only place needed for all things lawn related. When in central Illinois, look the company up for all lawn mower needs. Or visit online at GermanBliss.com. Or if you're in need of replacement parts, German Bliss also has its very one online parts store where you can find a huge inventory of parts and components on a number of name brand mowers and landscaping equipment. Visit store.germanbliss.com to learn more.